The universities minister says he could have been “thrown out of university” as a student at Oxford because he was unable to pay his rent. But Sam Gyimah says his college converted the rent into a loan, which he paid back after he left. The minister was speaking to MPs on the Education Select Committee who pressed him on why maintenance grants were not being re-introduced. Mr Gyimah told them how financial support had helped him to graduate. The minister was replying to a question from Thelma Walker, an MP on the committee, who said she would not have been able to stay at university and go on to be a teacher, without having a maintenance grant to support her. Mr Gyimah, a comprehensive school pupil who studied at Somerville College, Oxford, gave an example of how he had depended on a financial bailout. “I would have been thrown out of university because I couldn’t afford my rent. “The only way I managed to survive and carry on was because the college converted my rent into a loan, which I paid when I left. “Now, a personal anecdote is never the best foundation for policy – but I can describe my own experience as the first kind of maintenance loan which got me through university,” he told MPs. Maintenance grants for disadvantaged students were scrapped by the government and replaced with loans, with interest rates that are set to rise to 6.3% from the autumn. It was a decision that was subsequently criticised by several former education secretaries, both Labour and Conservative. Mr Gyimah said that decisions on student funding would depend on the outcome of the government’s review, which would report back “early next year”. The minister was questioned by MPs on whether universities were really teaching more disadvantaged students than before tuition fees were increased in 2012. Committee chairman Robert Halfon called for a more “honest” debate about this – with MPs arguing that figures on recruiting disadvantaged students needed to include the collapse in part-time numbers. In the past decade, part-time student numbers have fallen by 61% – and MPs asked the minister how this might be tackled. 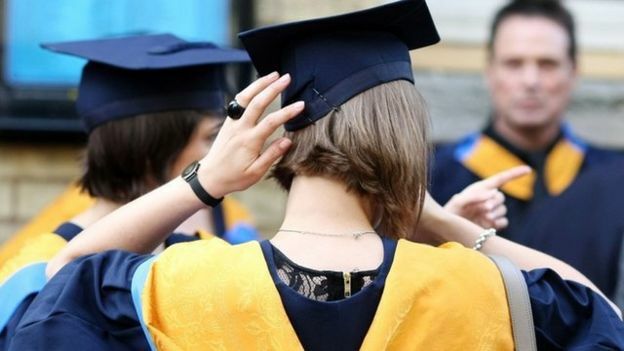 Mr Halfon warned that there was still a “major social injustice” in access to university. Mr Gyimah said there had been “deep-seated inequalities” but that there were efforts to achieve a more “level playing field”. But he warned that there was “no silver bullet”. Despite concerns over fees, Mr Gyimah told MPs that graduates continued to have significantly higher earnings. The universities minister also complained that despite universities spending £860m per year on outreach and widening participation, there was no clear evidence of what was the most successful use of this investment. Mr Gyimah also told the committee that he wanted universities to be more transparent with students, giving the a detailed breakdown of how their tuition fees were being spent. “Students are entitled to know,” said the minister.